SHOT HITS THE MARK - Lady Oiler junior forward Avery Barron (3) spins around a defender and into a goal-scoring strike as Pearland shutout the heavily favored 24-6A champion Clear Falls by a final score of 3-0 to win the bi-district opening round of the playoffs. Barron also had two assists in goals made by Zoe Valle and Lauren Moniot. 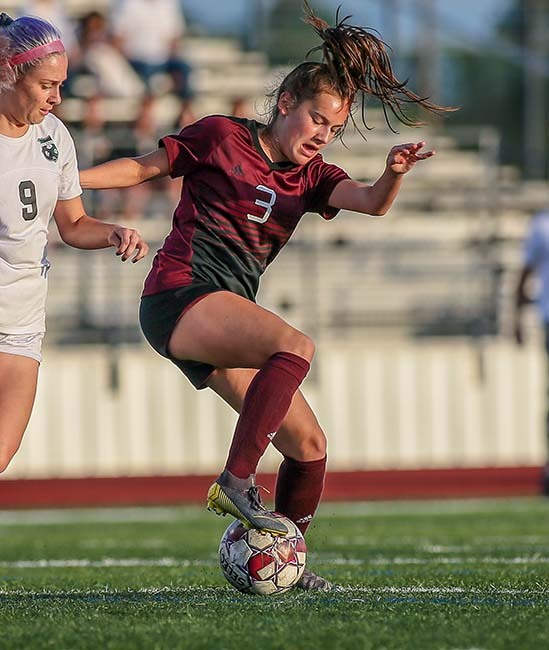 PEARLAND — Lady Oiler junior forward Avery Barron (3) spins around a defender and into a goal-scoring strike as Pearland shutout the heavily favored 24-6A champion Clear Falls by a final score of 3-0 to win the bi-district opening round of the playoffs. Pearland fell to the Lady Deer in the post-season in 2018.